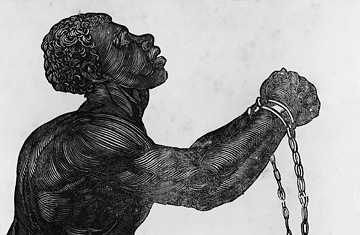 Woodcut of shackled slave, kneeling with Am I not a man and a brother? written on a scroll under him. The design was originally adopted as the seal of the Society for the Abolition of Slavery in England in the 1780s. Less than a dozen years after the founding of Jamestown, about 20 Africans from what is now Angola were sold to settlers of the fledgling colony. They found themselves in a raw, chaotic frontier society in which the English settlers were still trying to figure out the best way to survive and turn a profit.